While many consider wholesaling as nothing more than a lucrative source of income, others see it a great opportunity to be of service to others. In today’s episode, you’ll get to listen to an inspiring rhino who believes in the latter. Angel Webb is an awe-inspiring new rhino from Houston, Texas. 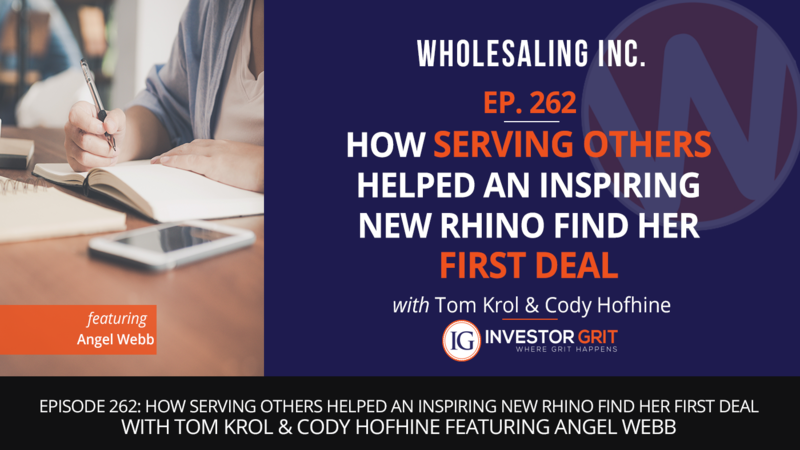 While her wholesaling journey has been far from perfect, the story of how she got her first deal and how wholesaling changed her life for the better has been nothing short of inspirational. If you are passionate about helping people and serving others, Angel’s story will surely resonate with you. Not only that, you’ll also learn so many gold nuggets—the importance of asking for help, the value of honesty, and why belonging to the right community can go a long way, among many others. Make sure you have a pen and paper handy. You’ll have plenty to take note of! Angel sent out direct mails to the absentee owners list. She got a call from someone who wanted help selling a house that belonged to his church. After finding out how she can be of service, she asked for help and guidance to close the deal. After all was said and done, she was able to purchase the contract for $80,000, sell it for $92,000, and earned $12,000 for her first deal. Definitely a worthwhile reward for the exceptional service she provided!